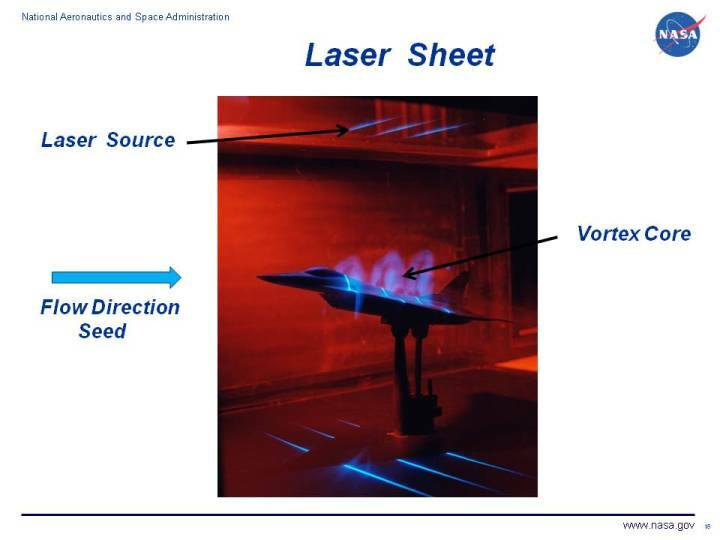 The figure shows an F-16XL wind tunnel model in the NASA Langley Basic Aerodynamic Research Tunnel (BART). The flow over the top of the aircraft has been illuminated by three laser sheets. In the laser sheet technique, a fine mist of seed material is introduced upstream in the tunnel. The assumption is made that the smoke or seed material moves exactly with the flow. A thin sheet of light is then introduced perpendicular to the flow, illuminating the seed material. Laser light is ideal for the light sheet because of the fineness of the beam and the monochromatic nature of the light. In the photo, we see that the laser sheets have captured the vortex shed by the leading edge extension of the F-16 wing at angle of attack. The vortex core moves away from the body as it flows downstream to the right. In a modern development, one can use laser sheets to not only visualize the flow but also to determine the local velocity in the flow. Digital Particle Image Velocimetry (DPIV) uses multiple laser sheet images and high speed computers to track the motion of the seed particles and, from the particle motion, derive the local velocity. DPIV is an attractive technique because it is non-invasive (the technique does not alter or disturb the flow) and it quickly produces large amounts of data which would be tedious to acquire using older flow mapping techniques like traversing probes. One disadvantage of the laser sheet technique is the flow region of interest must be visible to the source of the laser light. In our photo, we obtain no visualization of the lower part of the aircraft because the laser sheet cannot pass through the body from above.